Comments: Evergreen broadleaf native to coastal areas of Queensland and New South Wales, Australia. Waxy yellow-green 6" leaves and a straight white trunk which is mottled with grays and greens. 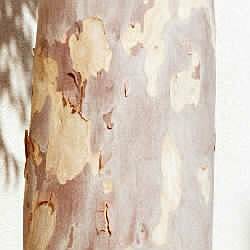 Bark flakes in oval shapes which often leaves dimples in the underlying new bark. This tree is tentatively identified as e. maculata or Corymbia maculata due to recent naming conventions. 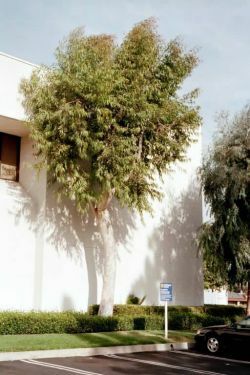 A similar, much taller, and closer to type tree is located at the "Old" City Hall.